(MENAFN - Caribbean News Now) BRIDGETOWN, Barbados — Off-spinner Roston Chase had one of the best bowling performances in West Indies history to grab the amazing figures of 21.4-2-60-8 as the home side beat England by a whopping 381 runs. The final wicket of the match was the 50th of his Test career. The six-footer recorded the second-best bowling analysis by a West Indian against England, behind 8-45 by the legendary Curtly Ambrose – 29 years ago also at Kensington Oval. 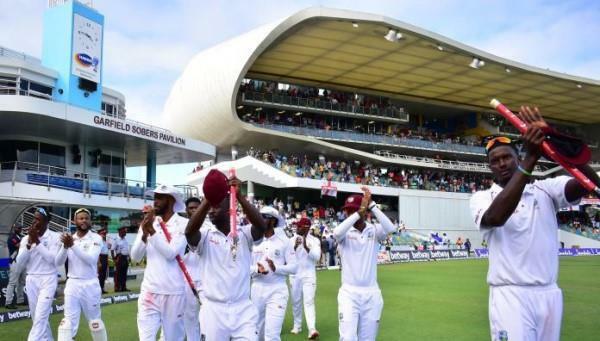 The fact that he has four Test centuries to his name, means Chase has now become the first West Indian to make a Test ton and also take an eight-wicket haul in his career. Asked to make 628 to win, England were bowled out for 246 after tea on the fourth day. The victory sparked celebrations and the Windies players were congratulated on the field of play by Mia Mottley, prime minister of Barbados. West Indies captain Jason Holder was full of praise and congratulated Chase on his herculean effort. 'Roston was a champion for us out there today, he put his hand up and counted when it mattered the most. He was excellent. We asked him to do a job and he stood up. Hats off to him and the entire team for a job well done… we planned really well and this was a great result to a truly wonderful and memorable performance,' Holder said. 'It was a really good match for me personally. To come back the way I've come back I'm really pleased. I have put in a lot of hard work over the last couple of months trying to get myself back to full fitness. I've had a lot of emotion bottled up for a long time. We still have a long way to go. One Test match doesn't make a summer. We've been in this position before, so lots of hard work to be done. We ticked a few boxes in this test match but it's a matter of turning up in Antigua and doing the same,' Holder added. Chase also celebrated the memorable performance and said he came into the day's play fully aware of the workload. He said he held several discussions and planned his bowling with Mushtaq Ahmed, the spin bowling consultant. 'Looking at the wicket, I always thought I would come into play in the second innings. The quicker bowlers set it up for us in the first innings and 'Mushy' told me I'm going to have to bowl 25 overs in the second innings, to get my mind ready for it, so I was always prepared to do some work, to give the pacers a rest. I started to pick up some wickets and it went from there,' Chase said. Holder, the highly-rated allrounder, was named Player-of-the-Match due to his majestic 202 not out from 229 balls in the second innings which helped to set England a target of 628 to win. He also held three catches in the slips and took two wickets in the England first innings of 77 all out.